Hot tub and swim spa dealers are being targeted by Wellis distributor and Superior Spas Managing Director Rob Carlin who is aiming to capitalise on enhanced unity during the Hot Tub Living Expo. 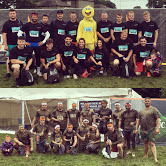 Thriving exclusive Wellis product supplier to British dealers Rob and members of his Superior Spas team, pictured, successfully overcame tricky obstacles to complete the Yorkshire Tough Mudder 2016 challenge and were so impressed with how it helped to bring them all together that they have now signed up for the Midlands Tough Mudder 2017 event. “We wanted to do something different to bring our team closer together and it has been extremely successful,” said Rob. Rob and his team are now gearing up for the immediate challenge alongside major hot tub and swim spa brand exhibitors at this year’s Hot Tub Living Expo, which was formerly the UK Pool & Spa Expo, to promote a flourishing array of hot tubs produced by Hungary-based manufacturer Wellis along with a new range of swim spa models. Taking centre stage in Hall 11 at the Birmingham NEC will be the Rio Grande, which comes in at 5870 x 2300 x 1500mm and has a separate seating area that features a lounge seat and seating options for three other people. Three River Jets have been incorporated within the Rio Grande’s swim spa area by the Wellis design team to provide a consistent and powerful water flow and complement a total of 58 jets. It has a LAING water circulation pump, double UV-C water sanitiser, and an Aromatherapy system. Comprehensive information about the new Rio Grande swim spa model and its Wellis counterparts, including the WhatSwimSpa? Best Buy Award-winning Wellis Danube Power Swim Spa, along with details about becoming a Wellis or Superior Spas dealer will be available on the respective stands during the Hot Tub Living Expo, open to the trade on October 24 and 25, following the Exclusive VIP Preview Evening on October 23. “We will be showcasing our Rio Grande Swim Spa at the Hot Tub Living Expo, which we didn’t exhibit last year at the UK Pool and Spa Expo, as part of our new product range for current and prospective dealers,” said Rob.